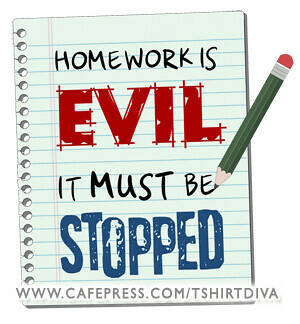 The image I selected is homework is evil, it must be stopped! For most of the classes the homework I do is not relevant to the subject matter. Sometimes I wonder why am i doing homework is it doesn’t relate to me… sometimes doing homework is a big waste of time. When homework attack your brain. This entry was posted in EdTech DEW Lines, Your Undergrad Experience to Date and tagged Assignment 1 by Dhruv. Bookmark the permalink. I agree with what you are saying and too much homework is no good. Teachers, we got a life!!! i agree i hate homework but at the same time i dont mind it because some homework is actually helpful … and helps me learn the subject more.. yet other homework is so pointless! Show your Avatar some love and get a Gravatar. And edit the image so that it includes a Title and a Link URL. And hyperlink some text in your description back to the source URL. Great to see you added a little bio to your profile. You can use html syntax to link your site. Yes of course I always end up doing my homework. But for most of my classes in York, the homework I get is pretty pointless. Yes I have having some issues with Gravatar right now trying to figure this out by tonight after work. Oh I know you’ll do all your homework. Of course you will! I was just trying to bring some levity to the normally dull topic of homework. Yuck! I’ll try again. If you don’t do your homework young man I will send you to become a slave to the demon prince and lord of the undead, Orcus.